Meetings should be regular and scheduled in advance to allow for greater attendance. Activities and discussions should be founded on the strengths and passions of the participants. They should be of interest to the participants and be both inclusive and fun. Remember that while it is important to set up your program and activities, in the end your focus should be supporting the mentoring relationship. Activities are just a way to support the relationship. When developing any program, always reflect upon best practices. Best practices for youth mentoring programs are outlined throughout this toolkit. Along with the considerations outlined in this section of the Girls Group Mentoring Toolkit, we encourage you to apply the Best Practices from Canadian Women’s Foundation (2014) throughout your program design and delivery. Canadian Women’s Foundation is dedicated to ongoing evaluation and continuous improvement to support programs that reflect best practices when working with girls. Through surveys, focus groups and interviews, girls, parents and program staff have had the opportunity to identify critical elements that help shape the success of the girls’ programs. Provide mentees with an opportunity to share their input on the activities and take the discussions and activities in the direction that are most helpful and interesting to them. Debrief after activities and sessions to help the girls reflect upon their experiences, share their learning and integrate what they are learning. Allow time for relationships and connections to develop. Allow the participants time to share about their lives and experiences. Give each participant the opportunity and encouragement to take on a leadership role. This could be helping to design or lead an activity, leading a discussion, preparation of a snack or assuming responsibility for setting up and taking down the space. Involve the girls in decisions about the program and allow them to take ownership so their specific needs and desires are accommodated. Some girls group programs open their visits with a talking stick, used in some Aboriginal Communities. The stick is passed between members to share about what’s happened since they last met and what’s on their mind. Ensure that mentors are fair and treat everyone equally so that they feel like a part of the group. Similar interests between the girls should be highlighted and appreciated. At the same time, the uniqueness of each individual should be celebrated and valued. Manage girls’ input to ensure that the topics or activities are best for the whole group and ensure all of the girls can participate in the activities. Take time to get to know the girls so that you can help to tailor the activities to their interests and personalities. Work within your group dynamics. When/if providing snacks or meals, check to see if there are any dietary restrictions or other health concerns that must be taken into account. Make the sessions interesting by organizing a field trip, using creative forms to express ideas and inviting guest speakers to share special knowledge. Plan for the visits and set achievable goals. There are an immense variety of ideas for group activities and discussions. If mentors will be planning the activities, be sure to share the above tips with them. The range of topics and activities could include: social media, safety, bullying, healthy relationships, positive youth development, women in STEM (science, technology, engineering and mathematics), among others. There are many online guides and resources available to support mentors, parents and youth-serving programs. Incorporating a variety of learning approaches can help to best meet the diverse needs of girls in your program. It would be considered a best practice to diversify the types of learning your program will use and reflect on the learning strategies best suited for different learning styles. The Eight Intelligences organize the different kinds of aptitudes that we all possess, and we should create content, space and programming that draws on all eight areas so each girl has a platform to share their talents and use their skills. You might consider having girls complete a quiz in the beginning of the program to determine the different intelligences and talents within the room. You make sense of the world through language and can use words effectively either speaking or in writing. When you make puns and tell stories, you exhibit this intelligence. use your verbal/linguistic knowledge to help you study. For example, if you are taking a course in music, make up a story based on what you hear. You appreciate abstract relationships and can use numbers effectively. When you enjoy statistics and analyzing the components of problems, you exhibit this intelligence. use your logical/mathematical skills to help you study. For example, if you are learning about the earth, look for cause-and-effect relationships among geological events. You are able to perceive visual/spatial information and can create effective mental pictures. When you like doodling, you exhibit this intelligence. use visual/spatial topics in your studies. For example, if you are studying a different culture, write an essay exploring their art and paintings. You are able to recognize and understand the motivations and feelings of other people. When you enjoy being on a team/group, you exhibit this intelligence. use interpersonal topics in your studies. For example, if you are studying history, write an essay in which you role play with an historical figure. You are able to distinguish among your own feelings, build accurate mental models of yourself and draw on these models to make decisions about your life. When you can capitalize on your strengths and know your weaknesses, you exhibit this intelligence. use intrapersonal topics in your studies. For example, if you are studying history, analyze the effect of leaders' decision-making styles. You use all or part of your body to create products or solve problems. When you enjoy sports and dance, you exhibit this intelligence. use your bodily/kinesthetic intelligence in your studies. For example, if you are learning mathematics, use different parts of your body as measuring tools. You can create, communicate and understand meanings made out of sounds. When you notice sounds and tap out rhythms, you exhibit this intelligence. use music topics in your studies. For example, if you are studying a different culture, ask if you can write an essay about its music. You can distinguish among, classify and use features of your personal environment. For example, if you build collections of items such as stamps, films or musical recordings, you exhibit this intelligence. use examples of your environment in your studies. For example, if you are studying literature and you work in an auto body shop, ask if you can write an essay about the automobile in poetry or a novel. It is also important to reflect on the most effective ways of learning information and engaging with activities. 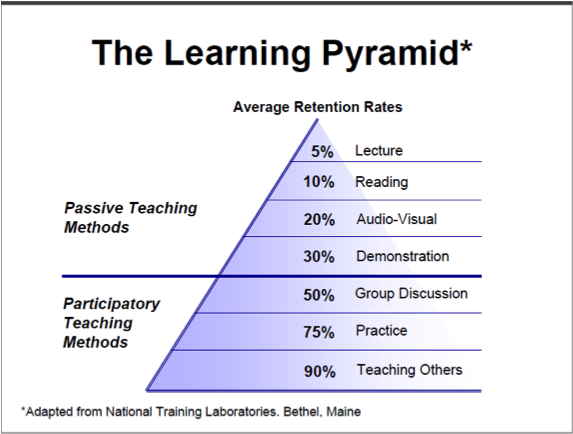 The Learning Pyramid, developed by the National Training Laboratories in Betel, Maine, outlines the different methods of learning and the respective percentages of retention of information. The first four levels are labelled ‘passive’ learning methods; the bottom three are active ‘participatory’ learning methods that elicit higher levels of retention or engagement. With this concept in mind, the research suggests that designing activities and content for your program should ensure space is created for learners to actively engage with the process through discussion groups, collaboration, application, practice activities and by teaching to one another. The following list offers some examples of different activity approaches and their associated considerations. Note these are not exhaustive categories and present just some areas to explore. Some approaches are used in isolation, while others are combined within the programs. These approaches can be seen as a continuum and taking a blended approach is common and can be very complementary. These approaches will help inform and develop the content for your program. Topic-based activities focus on discussion of specific themes and topics, whether preplanned or directed by the girls and their interests. Some programs will start with a large group discussion/exercise/learning and then break off and explore the topic through concentrated small group discussion and real-world application. This allows organizers to explore specific themes and can be helpful to make the learning exciting and applicable. While bringing a gender-equity component with discussion prompts, topic-based activity can create space for girls to learn voice, form opinions and openly reflect on experience. Curriculum-based activities use preplanned session guides for the duration of the program. Typically there is a progressive nature of the sessions leading toward an end learning goal. Curriculum can explore one main learning focus or a number of key themes, but a goal should be established and curriculum should be set in advance to work toward the goal. While this structure can be helpful, it can also hinder the girl-directed nature of the mentoring programs. Be mindful of leaving space for this by having time each week for girl-directed discussion or sessions that will be determined by the girls themselves. Goal-focused group work is used by some girls group mentoring programs to work toward a long-term goal without the presence of a formal curriculum. This is usually a large culminating project, art collaboration or community event where there is plenty of opportunity for ongoing development toward the end goal. The goal should have multiple components so girls can collaborate and work toward it—and so there is space for their varied skills, talents and interests. Room should be made for girls to direct this process, and the planning/activities should take place within the smaller mentoring groups so relationships can forge and discussion can freely take place. Large group with smaller break-off groups. This approach is often used in combination with the other activities outlined, and organizes sessions around two main activities: an initial large group activity or discussion and then a smaller group activity or discussion that relates. This allows for structure while still leaving room for girls to direct the smaller discussion, and it provides the opportunity to schedule in specific topics and learning themes while still facilitating the fluid relationship building within the matched mentoring groups. Community-based outings take place off-site and in the community. They usually involve external activities such as bowling or attending the movies but can also include community service work. These activities require greater consideration around youth safety, liability and screening. Since staff cannot typically take part in each of the small mentoring group outings, the mentors are taking on significant responsibility for the girls. As such, it is usually adult mentors that take part in this approach. Recognize that the success of certain activities rests on many factors and is often specific to the girls in your group. What works with one set of mentors and girls may not be as well-received with another. Be ready to adapt and test different approaches to find out what each of the groups are more interested in and receptive to.